Well, that’s the Premier League over for another season. But at least Euro 2016 is just around the corner. We’re so excited about it that we decided to give stuff away! 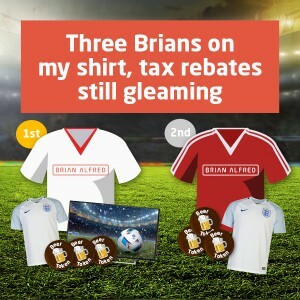 If you fancy following the Euros with us and winning BIG, then get involved with our “Three Brians On My Shirt” competition. To enter the competition, simply head to our Facebook page, ‘Like’, share and tag; the Baddiel to your Skinner in the comments section on our post. AND if you recommend one of your mates to us in June, you’ll double your chances of winning! If you thought it was all over, well it’s not… now. Two winners of the Three Brians Facebook competition will be drawn at random after the final on 11th July 2016. It’s coming home… Nice one Brian! The prize draw is open to followers of Brian Alfred who have liked the Promoters Facebook post from the 25th May to the 10th July 2016. Entry is free and limited to one entry per household. The closing date of the prize draw is 23:59 on 10th July 2016. Entries received outside this time will not be considered. The draw will take place on the 11th July 2016. Two winners will be chosen from a random draw of entries received in accordance with these Terms and Conditions. Winners must send an image of them wither their prizes to Brian Alfred by email or social post once received. If the winners cannot be contacted within 7 days of the closing date, the Promoter reserves the right to conduct a second draw. The winners will receive the prizes by courier.